This fraternity was completely destroyed by a fire that was started by a candle. 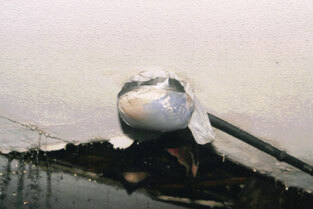 All of the smoke detectors had been covered with plastic so they would not go off. This delayed the alarm from activating and sounding a warning. Schoolwork, computer, books - everything was destroyed. 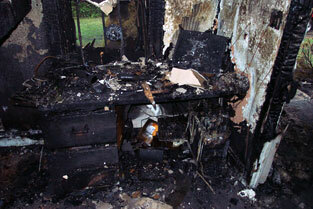 Unattended candles can lead to a fire that destroys your books, your schoolwork – or kills someone. Covered smoke alarms put everyone in danger. What may seem like a simple act can kill. At about 2:00 in the afternoon, one of the fraternity brothers woke up and, realizing he was late for class, jumped out of bed and in the process threw his blankets over a burning candle. He ran out of the house to catch the bus and by the time he looked back he could see the fire coming out of his bedroom window. Someone in the house saw the fire and called 911 to report the fire but gave an incorrect address. The building’s fire alarm system did not activate because the smoke detectors had been covered with plastic so they would not go off during a party they had the night before. The building was destroyed by the fire. When it was rebuilt it was equipped with automatic fire sprinklers. You need to know this information for after when you are visiting friends who live off-campus and for when you move out of the residence halls. This is only some of what you need to know. There is more information online at the links below. Over four out of five of the campus-related fire fatalities and injuries happen off-campus. Think about this when you are visiting someone’s house. Always know two ways out, wherever you are. The way you came in might be blocked when you try to get out. Your second way out might be something like a window. 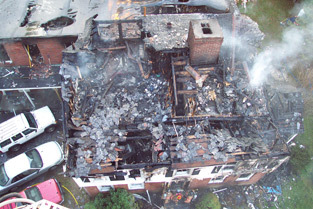 Fire sprinklers save lives, no two ways about it. They can put out the fire within seconds, long before any fire department can get there. Despite what you see in the movies, only one or two sprinklers will go off and they will put out the fire. Smoke alarms in the residence halls, you don’t need to worry about testing them. Facilities will do that. Do NOT cover them with anything. It puts you and everyone around you in danger if they can’t do their job. When you move off-campus, make sure you have working smoke alarms in your home. They can save your life. Watch these videos to learn more about smoke alarms and escape planning. Smoke alarms – install them, test them, maintain them. They can’t save your life if they can’t do their job. If you don’t have them, for the price of a pizza you can buy a smoke alarm. Escape Planning – Know two ways out, no matter where you are. Your second way out may be a window. Be ready, know what to do before the emergency. There is a lot more that you can know to be fire safe. For more information, visit these links.